We moved to the mountains in 2004 and always get excited when loved ones visit so we can play tourist and visit some of our favourite places in Banff and the Canadian Rockies. 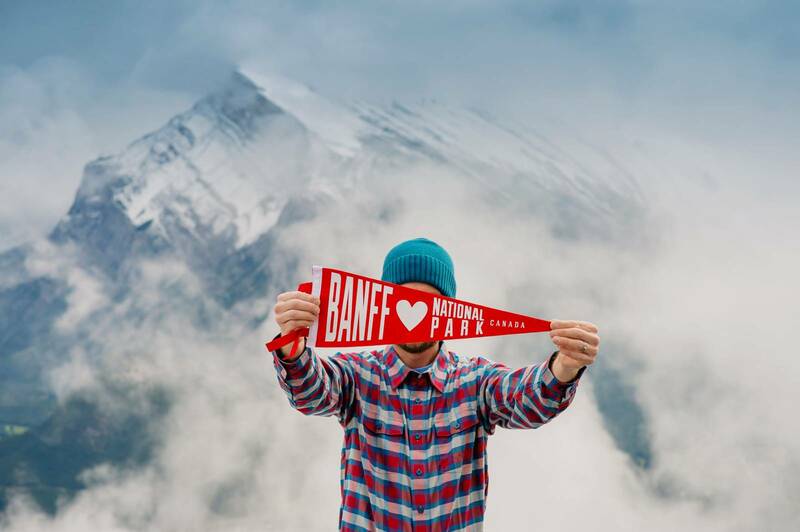 There is so much to do in Banff National Park so I've concentrated on activities that are accessible for most, family friendly and all seasons. If you are looking for some suggestions on great hikes in the Canadian Rockies we like this book. For those of you who would love to read about the geology, animals and flowers of this area this book is our favourite reference guide. You can find my list of Things to Do in the mountains which includes more than this brief summary but I wanted to create a blog post that would be easy to share and reference for those coming to spend a few days in the mountains. I also share in-depth guides to my Favourite Places to Eat in Banff and My Favourite Places to Eat in Canmore for reference. My hope is that this blog post can serve as an introduction to this vast area and will inspire your visit. A beautiful drive and tour of Banff is the Lake Minnewanka Loop. You can stop at Two Jack Lake above and Lake Minnewanka below and both offer picnic tables. You'll find fire pits at Lake Minnewanka and it's the only lake in Banff National Park that offers boat tours. A lot of locals in Banff hike up Tunnel Mountain daily and in all seasons and weather. It's about a 45 minute switchback hike up to the top and offers gorgeous views at every step along the way. If you want to attempt this hike in the winter definitely purchase ice cleats for your shoes. Mount Norquay is a beloved local ski hill in Banff but did you also know that you can ride their North American Chairlift in summer for sightseeing. It offers great views of Banff below perfect for photo opportunities and you can enjoy food and craft beers in the recently opened original Cliffhouse Bistro from the 60's that Marilyn Monroe visited. I adore the open 12 minute chairlift ride to the top but I made the mistake of taking someone who is afraid of heights and they were terrified...oops! In addition to downhill skiing, Mount Norquay also offers a tubing park for non-skiers which is a ton of fun. They also have night tubing for a fun night out with friends. The Banff Gondola recently underwent an extensive renovation and it now offers even more views from it's rooftop observation deck and the Sky Bistro offers the best lunch views. If you feel like you want to earn your views you can hike up Sulphur mountain in about 2-3 hours and then pay for a one way ticket down the gondola but just be mindful of the gondola hours so you don't find yourself at the top without a ride down. Surprise Corner in Banff offers beautiful views of the Banff Springs Hotel worthy of a photo op. If you are driving towards the Bow river on Banff Avenue take a left onto Buffalo Street (there is a CIBC bank on the corner) and take Buffalo Street up to a parking lot. The Banff Canoe Club located on the Bow River offers canoe rentals, stand up paddle board rentals and kayak rentals in Banff. It should be noted that at $40 for the first hour the Banff Canoe Club offers the least expensive canoe rental rate in the Canadian Rockies. There are so many types of places to stay in Banff here are just a few suggestions based on where my family has stayed when visiting. Buffalo Mountain Lodge | Located on quiet Tunnel Mountain a 5 minute drive from downtown Banff. Wood burning fireplaces & clawfoot tubs. Outdoor hot tub. Banff Boutique Inn | A historical home converted into a B&B on a quiet residential street just a 5 minute walk into town. Abegweit | A huge historical home located right on the Bow river a short walk into downtown where the whole family can share a house. The Moose | Located right on Banff Ave. Rooftop hot tub with views. I love the historical house in the courtyard that you can rent. Hidden Ridge Resort | Located on quiet Tunnel Mountain a 5 minute drive into downtown Banff with kitchenettes and an outdoor hot pool with a view. Storm Mountain Lodge | Located 20 minutes outside of Banff between Banff & Lake Louise. Rustic historical cabins from the 1920's with fireplaces and claw foot tubs. The Banff Farmer's Market is held in Central Park every Wednesday in the summer and The Canmore Farmer's Market is held on Thursdays in front of Town Hall. They often share the same vendors but there are some vendors that only visit either Banff or Canmore too so it's worth checking out both. There are lots of opportunities for cycling in Banff for both beginners and advanced. The Legacy Trail runs between Banff and Canmore for those wanting a longer ride. In Banff I also love riding out to Vermillion Lakes and Sundance Canyon. A lot of cyclists love the hills of the Lake Minnewanka loop but be careful as it is a very busy road with a lot of RVs and bus traffic and no shoulder. Sundance Canyon is a beautiful paved path located just past the Cave & Basin in Banff. Bring a lock so you can park your bike at the end of the trail and hike up Sundance Canyon. I love riding my bike out to Vermiliion Lakes. Johnston Canyon is beautiful in all seasons but I love it most in winter when it is frozen and the crowds are much less. 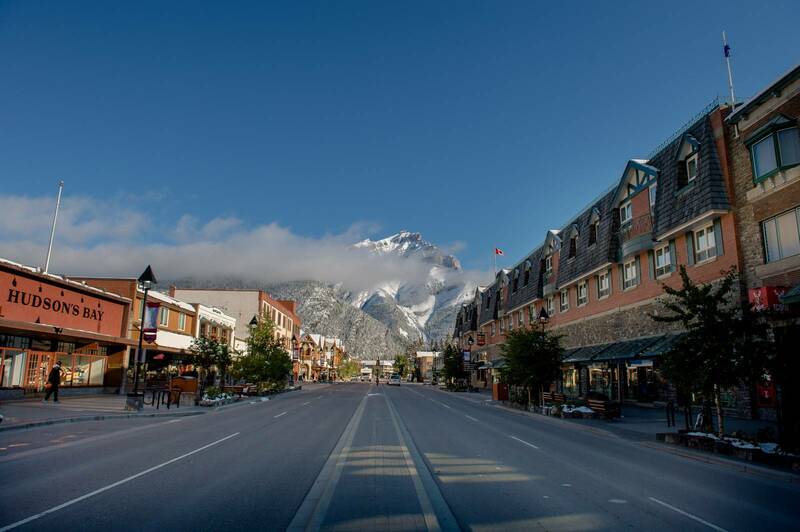 Bear Street runs parallel to Banff Avenue and is filled with cafes, shops and restaurants that are worth a wander. Located just 20 minutes outside of the Town of Banff is the historic Storm Mountain Lodge. I love staying in the historic rustic cabins and snowshoeing around the property. The lodge has amazing food so it's definitely worth stopping in for lunch or dinner while out adventuring. Bowling | Pins, Pints & Pizza! High Rollers bowling alley is a really fun place to hang out. They also have 50 beers on tap and delicious pizza. In winter you can Learn to Curl at the Banff Fenlands. The Banff Fenlands even offers beginner classes with everything you need for a fun night out with your friends. The Whyte Museum in Banff is the perfect spot to visit on a rainy day. They have an amazing collection of historical Banff work and contemporary work. Their gift shop is also a great spot to purchase local art. Lake Louise is beautiful in all seasons with lots to see and do. I love it in winter when it is a winter wonderland and much quieter than the busy summer season. You can canoe on Lake Louise which is a wonderful way to experience the stunning waters and surrounding views. It is $115/hour for non-hotel guests. In winter Lake Louise has the most beautiful outdoor ice rink created by the Fairmont Chateau Lake Louise. In December they even build an ice castle on the ice rink. You can rent skates in the Chateau. The Post Hotel is a hidden gem down the hill from Lake Louise. The service is fantastic and they have a world famous wine collection. You can stay in one of their riverside cabins or in the main hotel. We often stop into the Outpost Pub located in the Post Hotel for a post hike burger. In the winter a spot beside the fireplace is the perfect place to cozy up. Located in The Post Hotel is the Fondue Stubli. A 22 person fondue restaurant that is cozy and romantic. I especially love it in winter. Located in Lake Louise is the Lake Louise Station restaurant in the historic Lake Louise train station. You can book one of their dining cars for a private dinner or stop into the train station for a casual meal surrounded by antiques from the train station. The Fairmont Chateau Lake Louise is located mere steps from the iconic Lake Louise. It is a winter wonderland with horse drawn sleigh rides, an ice bar, ice skating and pond hockey and snowshoeing or cross country skiing on the frozen lake. In the summer hike up to Lake Agnes Tea House. It's about an hour and a half up and you can reward yourself with fresh baked goodies (if you go early enough!) and tea. You can also visit The Plain of Six Glaciers tea house for those of you who are looking for more of a full day hike at Lake Louise. Moraine Lake has become the busiest destination in the Canadian Rockies and it is easy to see why with the beautiful glacier lake surrounded by the Valley of the Ten Peaks which was once the view depicted on the Canadian $20 bill. The parking lot at Moraine Lake is quite small so Parks has to close the road to access Moraine Lake often when it becomes over capacity. There is a shuttle you can take to reach Moraine Lake for $25/person. For the best that Moraine Lake has to offer book yourself a stay at Moraine Lake Lodge where you will have a parking space and can enjoy Moraine Lake in the early mornings and evenings when it is quieter. There are also incredible hiking trails that start right at Moraine Lake. Guests of Moraine Lake Lodge also get to enjoy canoeing at no charge. For those who are not guests of the lodge you can rent canoes at Moraine Lake for $105/hour. Depending on the snow the road to Moraine Lake is only open June-September. Make sure you get updates from Parks Canada before planning your visit so you are not disappointed if the road to Moraine Lake is closed. About an hour and 10 minute drive from Lake Louise on the Icefields Parkway is Bow Lake. A beautiful spot to stop in all seasons. There is a great hike that starts from Num-Ti-Jah lodge that takes you to the headwaters of the Bow river. The hike to Bow Glacier Falls is about an hour and a half from Num-Ti-Jah Lodge and is a great beginner hike but also a stunning hike for experienced hikers to see the headwaters of the Bow River. Peyto Lake located on the Icefields Parkway about 20 minutes away from Bow Lake is a beautiful spot to stop for a photo opportunity. The lake is said to resemble a wolf head from above. EDITED TO ADD: Access to Peyto Lake will be closed for the 2019 season while they upgrade the parking lot and facilities to accommodate more visitors. The Icefields Parkway is a gorgeous road to drive with beautiful stops along the way like Bow Lake and Peyto Lake. Jasper is about a four hour drive from the town of Banff. I don't cover Jasper in this blog post and I'll be brutally honest I feel like if you are here for less than a week the 4 hour one way drive to Jasper, in my opinion, is too long and not worth that big a chunk of your time in the mountains. A lot of people tell me that Jasper is their absolute favourite destination for backpacking and backcountry hiking because it is much less busy than Banff but if you are just going to tour around, I don't find the town of Jasper to have as much to offer as Banff, Lake Louise or Canmore especially given the long drive required. Yoho National Park is located just over the border in British Columbia and offers incredible hiking, canoeing and beauty in all seasons. It is a stunning winter wonderland perfect for cross country skiing and snowshoeing. If you are wanting a winter wonderland wedding then Emerald Lake and Lake Louise typically get the most snowfall over other places in the Canadian Rockies. Cathedral Mountain Lodge is a perfect unplugged retreat with cozy cabins with wood burning fireplaces. Located close to Takkakaw falls and just a 12 minute drive to Emerald Lake. It used to be our favourite staycation spot but they no longer offer pet friendly cabins. Emerald Lake Lodge is located on an island on the shores of the stunning Emerald Lake. It is gorgeous in all seasons. I love the fact that the rooms don't have wifi or tvs for a perfect unplugged retreat. The wood burning fireplaces in every room make it cozy. The rooms are older but the accessibility to being right on Emerald Lake is stunning. There is a beautiful trail around the lake that is flat and easy for everyone that takes about 2 hours (if you take a lot of photos like me) and bigger hikes for those who are craving more. In the summer you can rent canoes for $70/hour and in the winter you can rent snowshoes and cross country skis. It's one of our favourite places to visit. Emerald Lake is about 20 minutes away from Lake Louise. Lake O'Hara in Yoho National Park is a breaktaking world UNESCO site. It is on my bucket list to stay in one of the cabins at the Lake O'Hara Lodge. No private vehicles are allowed to preserve the location. You can book a day bus to visit Lake O'Hara. Reservations are taken on April 20th and usually sell out within 5 minutes of the website opening up for the year. In the winter you can cross country ski in to visit the lake. It is our favourite place to hike and absolutely worth setting your alarm to book a seat on the bus for your visit. Located about a 20 minute drive from Emerald Lake in Yoho National Park is Wapta Falls. An easy family friendly hike. Kananaskis offers some of the best hiking in the mountains. It is MUCH less busy than nearby Canmore or Banff because it is a destination just for hiking and camping. We loved our stay at Sundance Lodge in Kananaskis. It is perfect for beginner campers or those who want to camp during their trip to the Canadian Rockies but not have to bring all of their gear. You can stay in a tipi or a canvas tent. I love how far apart the adjoining sites are compared to most camping sites as it offers more privacy. The store on site offers all of the supplies you need and you can even rent cooking supplies for your camping trip. They are pet friendly. I love that there are showers on site too. About a 5 minute drive away is Troll Falls which is an easy 1 hour hike into a beautiful waterfall. Upper Kananaskis Lake is a beautiful spot and we love the hike that starts there up to Rawson Lake. There are beautiful hikes in the quiet Kootenay National Park like Floe Lake and Stanley Glacier that are worth making the pretty drive out for. Along the way you can stop at Kootenay Park Lodge and stay in a historic cabin. Be sure to visit the nearby Marble Canyon which is an easy walk and MUCH less busy than Johnston Canyon. Canmore is about and hour and 10 minute drive from Calgary and is 20 minutes away from Banff. 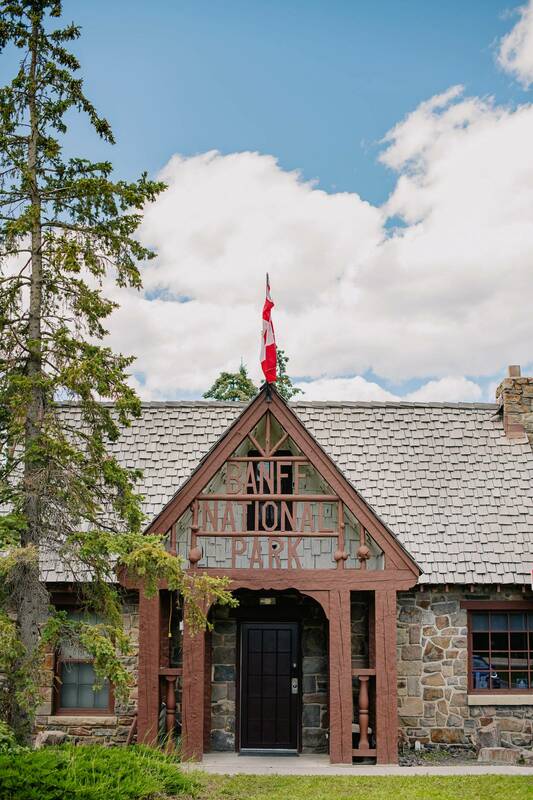 It's your first stop in the Canadian Rockies. It's much less busy than neighbouring Banff and offers more modern accommodation options often for less than other locations in the mountains and there are lots of great restaurants in Canmore. Basecamp Resorts | Recently most of my wedding couples have been staying at the modern Basecamp resort and have loved it. It's modern interiors offer a small kitchen and laundry machines perfect for longer stays. It is like having your own apartment. There is a rooftop hot tub with views of the mountains. You can walk into downtown. Downside is the busy location in between a train track & a busy road. Creekside Villa | A modern Family owned B&B located in the quiet residential neighbourhood of Cougar Creek. Paintbox Lodge | A cozy lodge right downtown with comfy rooms owned by Olympic medalist, Sara Renner and World Cup Champion, Thomas Grandi. Lamphouse | A former divey motor-hotel recently beautifully renovated in 2018. It's location can't be beat right on Main Street with modern rooms. Solara Resort | Kitchens, decks, a pool and spa. Great for longer stays when you want to be able to cook. Located on a cul de sac with lots of resorts. More of a car destination than a walking hotel. Wyndham Worldmark Resort | Located in the quiet residential neighbourhood of Three Sisters in Canmore with quick access to the highway Worldmark resort offers suites with kitchens for longer stays where you want the option to be able to cook at home. The Canmore Nordic Centre hosts Olympic athletes from all over the world in the winter for cross country ski and biathlon training. It's also the perfect place to learn to cross country ski. They have all the gear you need available to rent for cross country skiing in the winter and mountain biking in the summer on the extensive mountain bike trails. Perfect for trail runners as well. Snowy Owl dog sled tours are known for the ethical treatment of their dogs and it shows in the experience. That is why they are the only dog sled company that I recommend to visitors looking for an adventurous fun day out in the mountains. In addition to their winter dog sled tours Snowy Owl also offers summer tours of their dog kennels where you can meet the dogs and if you are lucky and plan your visit right maybe even get to meet the newest litter of puppies. Alpine Helicopters is based in Canmore and is known for their safety record. Take a heli tour year round and get an amazing perspective on the Canadian Rockies from above. Alpine Heli also offers memorable proposal locations and heli-weddings. The family friendly 45 minute hike up to Grassi Lakes is beautiful in all seasons. Make sure to wear ice cleats if you are hiking up in winter or spring. Dress in layers. Weather in the mountains is unpredictable and changes often. It can go from a sunny day to a rainy downpour or snow in minutes so bring rain layers on your hikes. Wear appropriate footwear. Hiking shoes in summer and winter boots in winter. You'll enjoy your trip much more if your feet don't hurt and you can access some beautiful spots. Some easily avoidable mountain rescues & hospital visits have been caused by people wearing flip-flops on hiking trails. Bring a long lens for your camera. There are lots of opportunities to spot wildlife while visiting. It's important for your safety and for the preservation of the wildlife here that you give wildlife a LOT of space. Do not approach wildlife. Stay in your car and use a long lens to capture photos of any wildlife you might be lucky to see. Change your USD to CAD at home. Some businesses do accept American money but only at face value so you won't be able to take advantage of the exchange rate. Be respectful of others on hiking trails. Don't play music or talk loudly. A lot of people cherish the peace and quiet that comes from being out in the mountains so please respect their experience by being quiet and giving others space on the trail. Drive the speed limit. The speed limits are actually to protect wildlife on the road from being killed from motorists. If you drive the speed limit you are also more likely to spot wildlife sightings along the side of the road. Don't feed Wildlife. Feeding wildlife often leads to their destruction when they become habituated to human food and have to be destroyed when they learn to approach people when seeking food. There is a saying "A fed bear is a dead bear". A pack of wolves had to be destroyed when irresponsible campers left out food at their campsite so be sure to clear your campsite of food that wildlife could access. Leave the Drone at Home. Recreational use of Drones are illegal to operate in National Parks. Anyone caught operating a drone within park boundaries and without an approved permit may result in law enforcement action and a fine of up to $25,000. Traveling with your Pet. There are only 2 vet clinics in the Canadian Rockies and they are both located in the Town of Canmore. The Canmore Veterinary Hospital & The Bow River Veterinary Centre both have extensive pet supplies like pet food, leashes, dog crates and dog beds if you need to stock up. Canmore also has a Pet Planet & Mut Hut. There is one dog shop in Banff called the Banff Dog House on Main Street but it is rather limited and more of a boutique than a supply shop so you are best to stock up in Canmore. There are no pet supply shops past Banff. 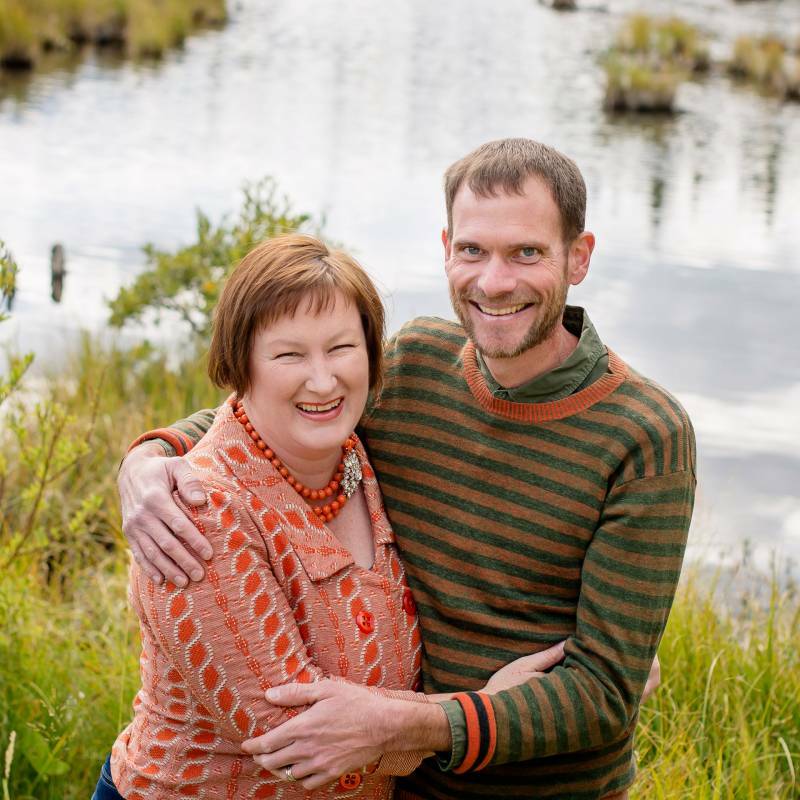 I am a wedding and elopement photographer currently living in Canmore who moved to Banff in 2004. I hope this blog post serves as a starting point introduction to this beautiful place. I would love to hear about your favourite places while visiting the Canadian Rockies in the comments below!